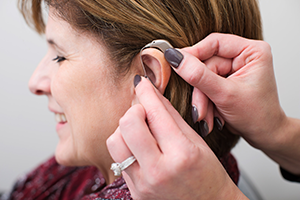 A visit to your local audiologist can point you in the right direction to remove your hearing aid feedback so that you can get back to hearing the sounds of your life with clarity and comfort. Hearing aid feedback is a sound generated within the hearing aid by extra noise. This noise often manifests as a high pitched screeching noise, and occurs when the hearing aid is in use. If you are struggling with hearing aid feedback disrupting your ability to hear throughout the day, consider these methods for eliminating hearing aid feedback caused by your hearing aid. Similar to microphones, specific mechanisms in the hearing aid react poorly with electronic signals transmitted into the ear. Many hearing aids include multiple settings that can differ in amplifications that increase the volume of the sound, or modifications which make the sound clearer. Certain settings, combined with specific types and volumes of sounds transmitted differently through the hearing aid can cause feedback that can be bothersome and unpleasant to hear. As the receiver in the hearing aid continually picks up a sound, feedback occurs when the speakers amplify it into a loop. This loop is what produces the annoying high-pitched noise of feedback in your ear. There are instances in which the holes in the hearing aids, known as vents, are occasionally the cause of hearing aid feedback. These vents are in place to release amplified noise from the ear canal. In addition to vents, there are other instances in which the dome on the hearing aid does not fit properly, in addition to issues such as earwax and fluid build up in the ear. Simple steps, such as replacing the dome on your hearing aid as well as keeping your hearing aid clean, can help to reduce and eliminate hearing aid feedback over time. A visit to your local audiologist can point you in the right direction to remove your hearing aid feedback so that you can get back to hearing the sounds of your life with clarity and comfort. This entry was posted on Friday, August 24th, 2018 at 1:59 pm. Both comments and pings are currently closed.